Ahh, British summers… So unpredictable. Whether we continue to get some stunning sunshine, or we have a wet summer, we’ve got a collection of top tips from our O2 Gurus to help you make the most of it with your smartphone. We can’t talk about being prepared for summer without talking about weather apps. Dark Sky is our O2 Guru’s #1 weather app which requires a yearly subscription (iOS – £3.99 | Android – £2.99) but with so many features, such as down to the minute localised forecasts, custom alerts and notifications in such a beautiful app, it’s money well spent. Looking to stay or get fit over summer? Grab a colleague and check out the Nuffield Health offer where you can get a week of workouts for the both of you, on O2. Looking to bring more sound to the office? Get 50% off JBL Connected Speakers in-store and online. Now that’s music to our ears. Entertaining clients this summer? With so much incredible live music throughout the summer, there’s bound to be a gig for you. On O2 you get access to the hottest gig tickets up to 48 hours before general release with Priority Tickets, and special perks at O2 venues. Many of us trust the cameras in our phones to take the best picture possible – and in many cases, especially with the advanced cameras on the iPhone X, Samsung Galaxy S9 and Huawei P20 Pro, they do. But there are easy ways to give your photos that extra edge to make them stand out on your businesses social media feeds or really pop on your website! This is our Gurus’ first stop to a better photo. In every photo, colour is often your number 1 priority. You might have a great angle and great subject, but what if the colour isn’t great? Enter, Lightroom. With it you have access to presets and filters, you can magically get rid of small objects or imperfections with ‘Spot Heal’, and get control over so many lighting and colour properties. Another one from those clever folks at Adobe, Photoshop Fix is great for selfies – something our team and guests were doing a lot of at our Regatta event yesterday! Adjust shadows and highlights, contrast and exposure, and also use powerful tools like Liquify, which has dedicated facial manipulation features such as making your eyes bigger or smaller, or maybe you just want to add a smile to a photo you forgot to smile for? With this app, you can do just that. SKRWT is a bit of a more focussed app, but if you want to fix distortion or perspective (mega important if your photos feature buildings or architecture) then this is likely the best app around, tailored to do just such a job. Invest in a battery power bank. You can buy one from us at Fidelity Group for under £10! You can leave the wallet at home. Did you know that with a combination of Contactless Payments (via Google, Samsung Pay or Apple Pay) your phone can do everything your wallet can? Doing a bit of a Bear Grylls and going for a nature walk or hiking? Your iPhone and most Android phones have built-in compass apps helping you navigate the old-fashioned way. We hope you’ve got the necessary Scout badges! Having already enjoyed some epic summer days even before the schools go on break, here’s hoping the great summer continues! 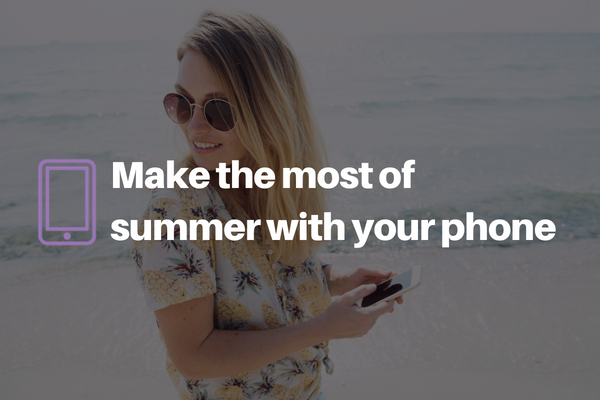 If you’ve got other top tips for enjoying summer with your smartphone, let us know on our social media pages!